For many decades Robert Strassburg figured prominently in the general musical life and in Jewish cultural circles in the Los Angeles area. Born in New York, he studied and worked with Igor Stravinsky, Walter Piston, and Paul Hindemithwith whom he studied at Tanglewood on a Boston Symphony scholarship. After bachelor studies at the New England Conservatory, he received his masters degree from Harvard, where he was the recipient of a fellowship in composition. Later, he earned a doctor of fine arts degree at the University of Judaism in Los Angeles. Strassburg was always dedicated to teaching. He was chairman of the composition and theory department at the Philadelphia Music Settlement School (1943-47), he lectured at Brooklyn College (1947-50), and he was on the inaugural faculty of the Brandeis Camp, directing the music program at its branch in Hendersonville, North Carolina, in 1950. He was also an artist-in-residence and taught at the Brandeis Arts Institute, a subsidiary program of the Brandeis Camp, for five summers (1951-55) in Santa Susana, California, where the director of musical activities was the conductor and composer Max Helfman (1901-63), one of the seminal personalities in Jewish musical creativity in America. That institute brought together college-age students and well-established Jewish and Israeli composers and other artists in an effort to broaden the horizons of young American artists and to introduce them to new possibilities inherent in modern Jewish cultural consciousness and artistic developments in the young State of Israel. In 1960 Strassburg moved to Los Angeles. He served as assistant dean of the School of Fine Arts at the University of Judaism until 1966, when he became a professor of music at California State University (Los Angeles). There, he also established and directed the Roy Harris Archives and published a catalogue of Harris’s works. Strassburg composed in nearly all classical media, and his own substantial catalogue includes many Judaically related works, secular as well as sacred. 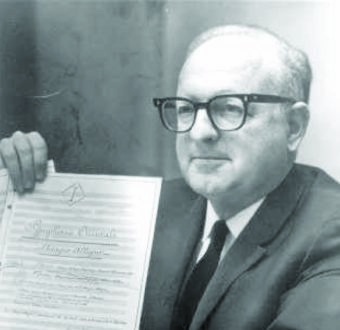 During his tenures as music director at various synagogues first in Florida and then in Los Angeles he developed a particular interest in liturgical music, and he composed numerous prayer settings. Among the best known of these are two Torah services, many individual prayers for Sabbath and High Holy Days, various Psalms, and liturgically related solo songs. Liturgical as well as Jewish historical themes also informed a number of his instrumental pieces, including Festival of Lights Symphony for string orchestra; a Torah Sonata for piano (with a version for string quartet, Tropal Suite); Terecentenary Suite for viola and piano; Patriarchs, four biblical portraits for string orchestra; and A gilgul fun a nign (Migrations of a Melody), on a text by Yehuda Leib Peretz, for baritone, narrator, and chamber orchestra. Apart from Judaic subjects, Strassburg’s lifelong passion for the poetry of Walt Whitman found its expression in many of his secular works. He was co-chairman of the Walt Whitman Centennial events, held at California State University. He also composed more than forty documentary film scores and wrote incidental music for such theatrical productions as King Lear, The Rose Tattoo, Anne of a Thousand Days, and The House I Live In. He was an active poet, and he published nearly twenty books of his own poetry during his lifetime.